Whether you are a cider lover, live only for gins, or a wine aficionado, here are some flavourful and delicious must-have drinks to have in your possession. If you're bored of the usual drinks on offer, we at The Amazing Blog have a selection of some traditional drinks with a unique and interesting twist. The Fifty Pounds Gin is produced by a family owned distillery located in London. It is traditionally made with the finest grains spirit distilled four times. The gin is produced using a method that is centuries old, known as Batch Process Distillation, which Fifty Pounds Gin hark as the best way to get the purest gin possible. It is thrice filtered, making sure all impurities are removed. It is self-proclaimed as the 'smoothest gin ever' and we have to agree. The method they adopt is delicate and painstaking; however, we reckon it is worth it. The botanicals selection, a combination of herbs, spices, fruits and flowers, makes it extremely delicious and nuanced in flavour. Where most gins focus on the juniper berries (the ingredient that makes gin a gin, and which can be a bit heavy or resinous), Fifty Pounds Gin have made the more mellow coriander seed their hero ingredient. Angelica root then contributes a lovely earthy and spicy flavour. It is a classic, smooth, rich and fresh drink that goes well with a good tonic and a lemon zest. A special mention should be made for the design of the bottle that is inspired by the first ever gin bottles, giving them a beautiful vintage appearance. You can purchase the Fifty Pounds Gin 70cl bottle here at £34.99. Cider Lovers are going to love the Cranes Cranberry Cider. When twin brothers Ben and Dan decided to go into the business they thought that cranberries should be the key ingredient of their drinks and they thought well! Cranes cranberry ciders are a mixture of the finest cranberries and apples which makes them very refreshing, light and tasteful. The ciders are naturally light as the sweetness comes from the fruits used during the production rather than additional sugars, and therefore they have 30% fewer calories than brand leaders. You can enjoy these sweet ciders guilt-free! These delicious cranberry ciders are available in three sublime flavours. The Cranberry & Lime is one of our favourites; it is crisp, light and ideal for an afternoon refreshment. The second flavour is Blueberry & Apple; a perfectly sweet pairing. The third flavour is the Raspberry & Pomegranate, which is as fresh and invigorating as the first two but with that little delightful fruity taste that makes all the difference. 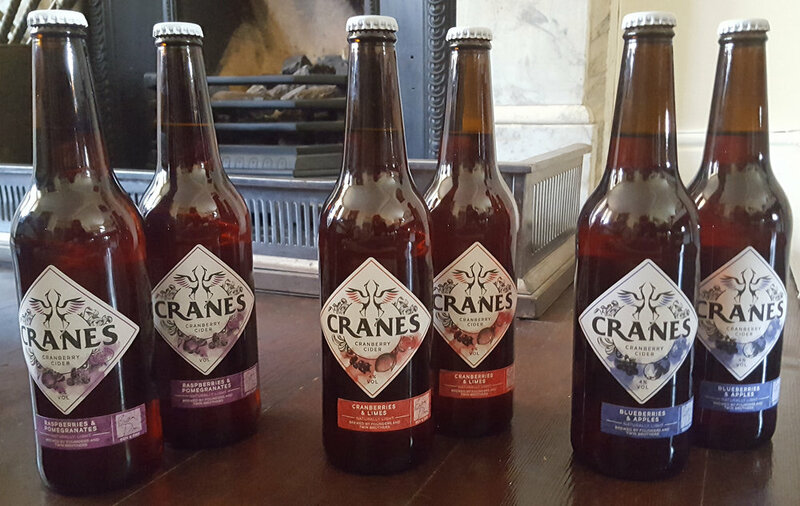 A case of 12 Cranes Cranberry Cider can be purchased here at £27.60. Famous for its alcoholic drinks, the Republic of Ireland will be soon renowned for its fruit wines. Móinéir wines are luxurious artisan fruit wines made in Wicklow Way Wines, the first ever Irish fruit winery. The wines are made from 100% Irish fruits. The Blackberry Wine is a delicious blend of blackberries and wild elderberries; an Irish plant that was foraged in the Wicklow Mountains. The wine is intensely flavourful and fruity but with a light body making it easy to drink. The Móinéir Blackberry Wine is a perfect choice for a light aperitif and goes wonderfully well with red meats. The brand’s Irish Strawberry Wine is created with juicy, delicious handpicked Irish strawberries gently pressed to capture the most of their flavour. It is an aromatic, slightly sweet and crisp wine that will satisfy the palate of wine lovers. Here at The Amazing Blog, we love combining it with some dark chocolate, a real treat! We love that these are a little taste of Ireland captured in a bottle. Both wines are suitable for vegans and are unique gifts to offer to your loved ones. You can purchase the Strawberry Wine here at 21.99€ and The Blackberry Wine here at 24.99€. Fortunately, you can buy the products in GBP by using PayPal. Sloane Home has found the way to our hearts with the Lone Stag Spirits: the LONE STAG SPIRIT Raspberry and Lime Gin Infusion and the LONE STAG ZESTY Clementine, Lemon and Lime Vodka Infusion.The drinks are traditionally produced in the heart of the British countryside with only the finest ingredients. Bottled, packaged and labelled by hand they are more delicious and savoury than any spirit made by machines. The spirits offer an excellent tasting experience; you can taste and identify all the ingredients used during the production. The sweetness and acidity are well balanced making the drinks taste natural, delicate and aromatic. The Lone Stag Spirits come in a fabulous case with cocktail ideas, transforming you into the new cocktails master. It is also a great gift for your friends and family. We are very fond of these flavourful spirits, and we are not the only ones. Indeed, the LONE STAG SPIRIT Raspberry & Lime Gin infusion was awarded a Great Taste Award by the Guild of fine food August 2017 and the LONE STAG ZESTY Clementine, Lemon & Lime Vodka infusion won the same award in 2016. If you want a taste of these delicious spirits, you can purchase a Sloane Hamper including both bottles here at £45.00. We here at the blog can no longer have a dinner or go to a party without one of these drinks. This great selection of diverse and unique drinks will be a show-stopper at any dinner party.